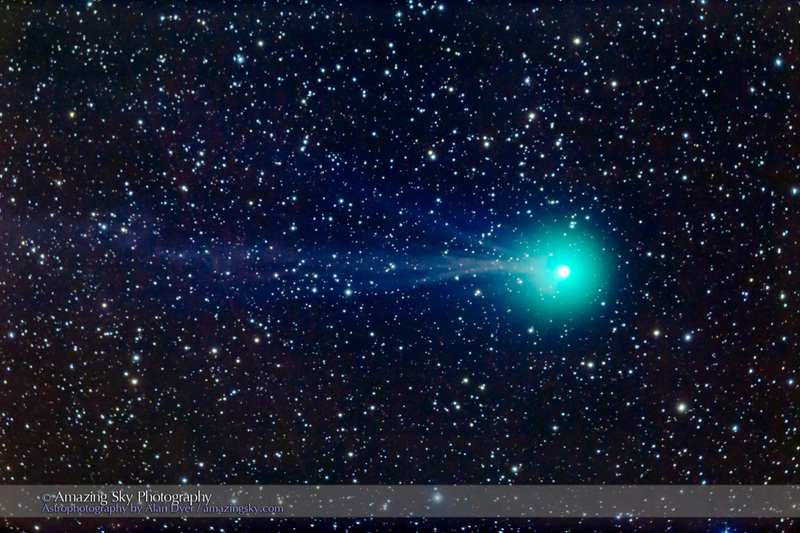 The coming week is the best time to sight Comet Lovejoy as it sails through Taurus. 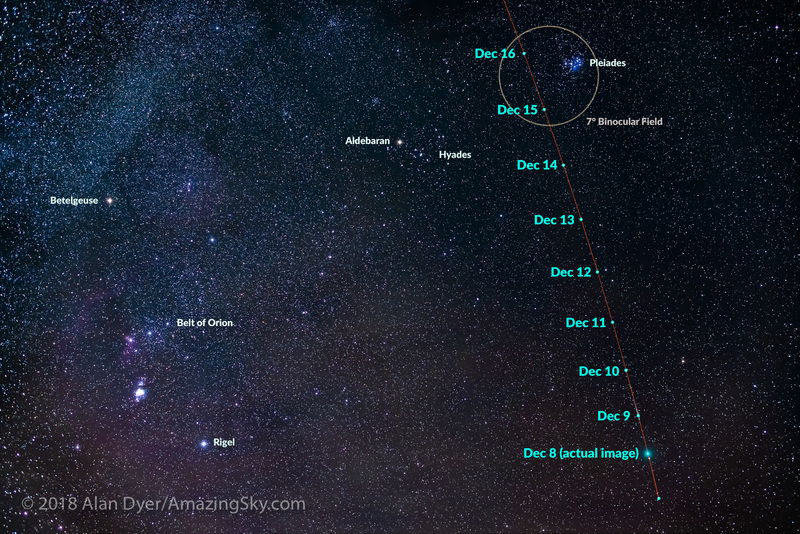 Here’s a finder chart for locating Comet Lovejoy (C/2014 Q2) over the next week as it climbs higher in our southern sky. It is well-placed high in the south as it gets dark each evening. Unfortunately, it doesn’t pass near any really bright stars to serve as a convenient jumping off point for finding the comet. 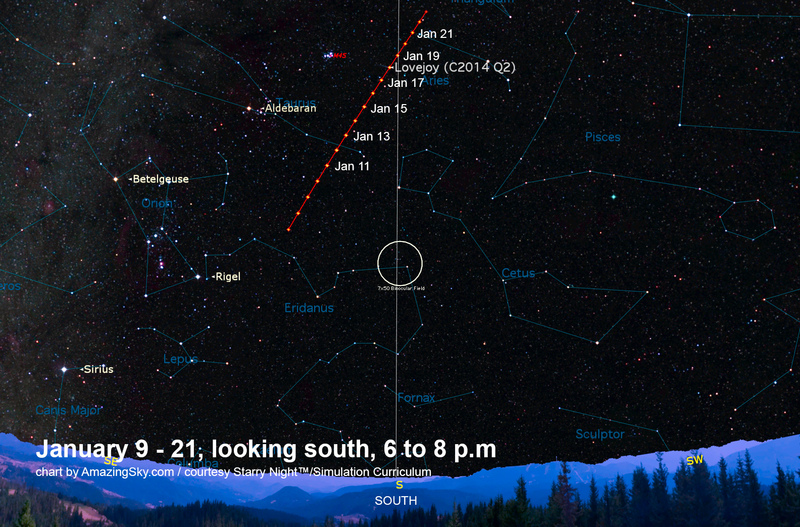 Look west (right) of the stars of Taurus the bull and the bright star Aldebaran by 2 to 3 binocular fields. In a dark sky, look for a fuzzy star in your binoculars. 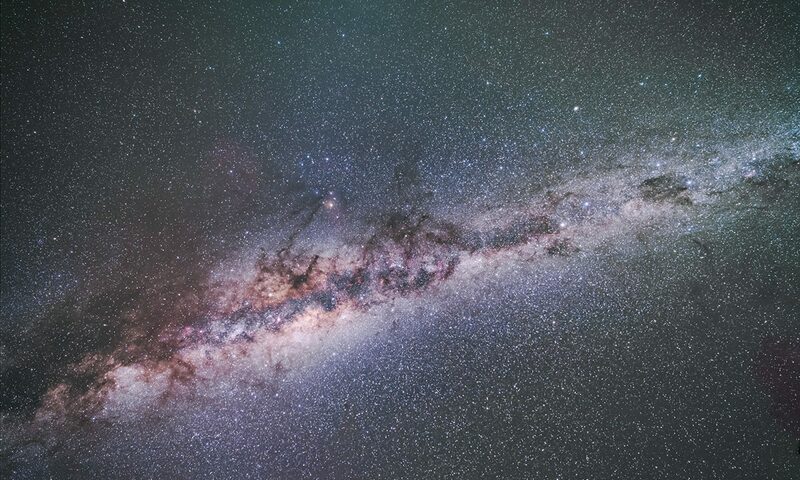 Once you find it with optics, if your sky is dark enough, you should be able to see it naked eye, but only just. In the city, forget it! 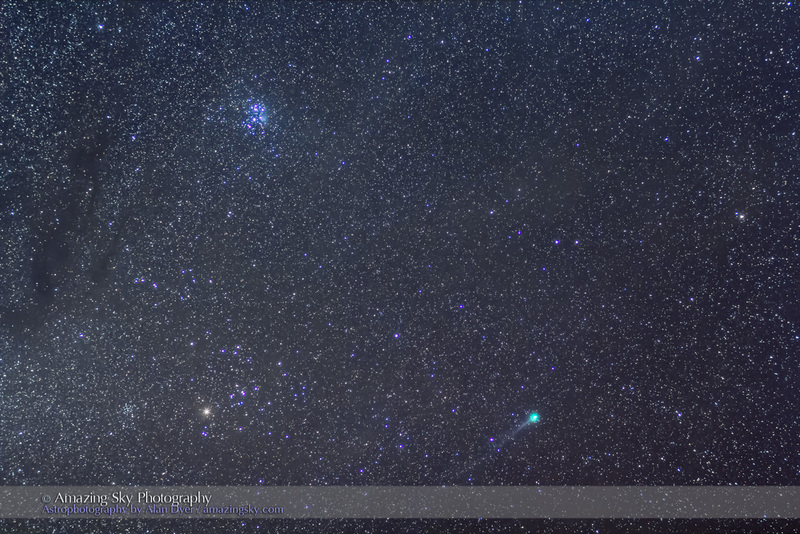 On the nights of January 17 to 19 Comet Lovejoy will be just over a binocular field to the right (west) of the distinctive Pleiades star cluster, marked here as M45, for Messier 45. Here’s the comet as it appeared on Saturday night, January 10, with it west of the V-shaped Hyades star cluster marking the head of Taurus and well below the Pleiades at top. 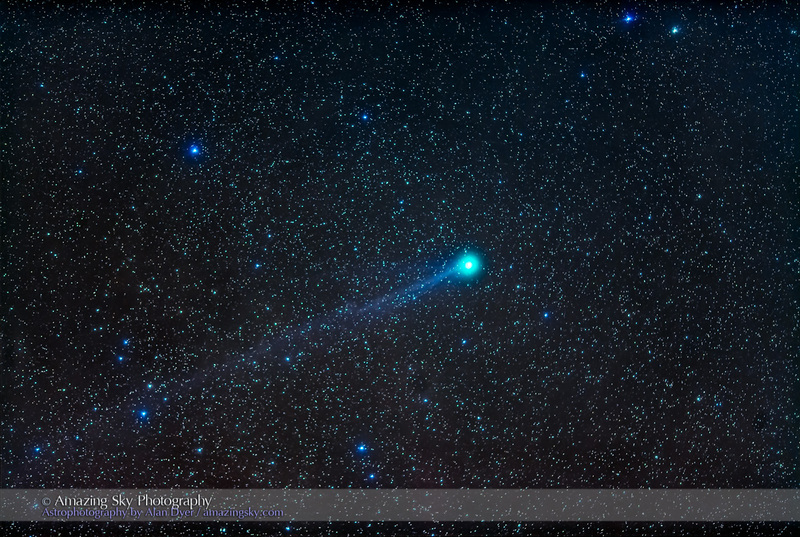 This is a closer view, with a telephoto lens, of the comet from Sunday night, January 11, showing how its faint blue ion tail stretches back several degrees. However, only the long exposures used here pick up the full extent of the tail. Visually, even through binoculars, just a hint of a tail is visible extending to the left away from the large fuzzy coma, or head of the comet. This is a closer view of the coma and ion tail, shot through a telescope on Sunday night, January 11. It shows some of the fine structure in the ion tail that is changing hourly and nightly, shaped in part by gusts of solar wind. 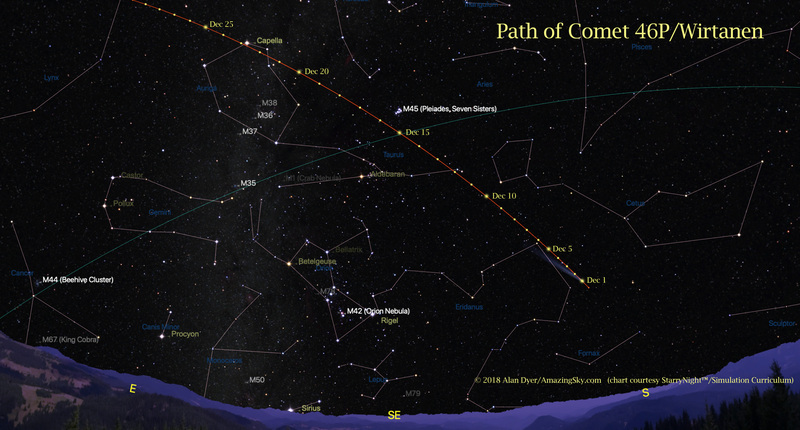 The comet is now at at its brightest, while the evening sky is now dark and moonless. 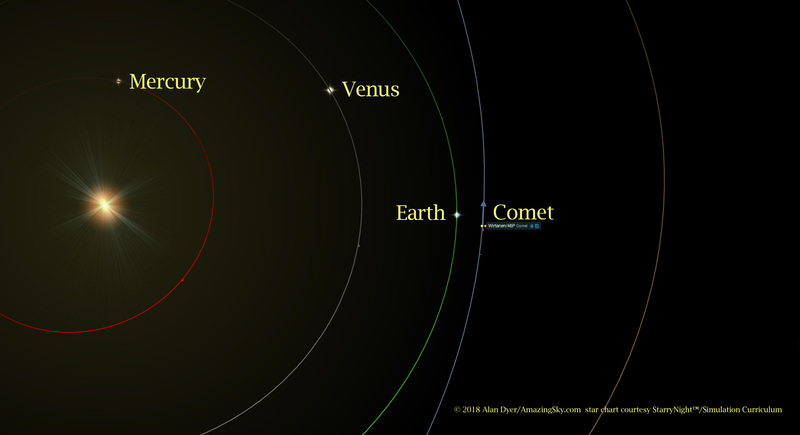 So head to a dark sky site, keep warm, and look up to enjoy our winter comet, coming to us from Australia where it was discovered by Terry Lovejoy. Chart courtesy Starry Night™/Simulation Curriculum.